The Christmas Season brings with it many things. There's cookies, presents, Santa, and mint-flavored-everything. However, there is a flavor/scent that is more commonly used this season, but for some strange reason, it's not as popular as mint. 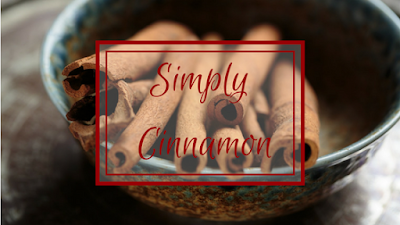 Cinnamon is one of my favorite scents and flavors for just about any time of year. It's just so warm and cozy. It's always comforting to smell and taste. But it's also a great herb to use in so many situations. Cinnamon, as we know it, is the dried inner bark of cinnamomum trees. There are around 250 species of cinnamon trees and several of these trees are commonly used and labeled as “cinnamon.” The two most common are Cinnamomum verum (Ceylon or true cinnamon) and Cinnamomum cassia (Cassia, Chinese, or Saigon cinnamon). There are quite a few other species used, but these two are the most commonly found here, with Cassia being the most common. However, Ceylon Cinnamon is more potent if you are looking to use cinnamon for it's health benefits. Stimulant, Tonic, Stomachic, Analgesic, Blood Alterative, Carminative, Anti-inflammatory, Antibacterial, Antifungal, Antiviral, Anti-Parasitic, Mildly Astringent, Anticancer, Antispasmodic, Antioxidant, Hypotensive, Aromatic, Aphrodisiac, and Insect Repellent. China's cinnamon tradition goes back almost as far as India's. In TCM, Rou Gui (cinnamon sticks) are used to reinforce fire, strengthen yang, dispel cold, stop pain, and warm meridians. This helps to invigorate the stomach, warm the lower back, reduce stomach bloating, and relieve abdominal problems associated with cold/excessive yin. Native to India, and known there as Tvak, cinnamon has a long history as a medicinal herb in Ayurveda. Common uses for cinnamon include balancing digestion, pacifying Kapha, balancing Vata, increasing the effects of other herbs, to pacify headaches, and even to keep joints healthy. Cinnamon stimulates the body and the mind. Externally, cinnamon essential oil makes an excellent warming liniment, helping to relieve sore muscles and stimulate circulation. Internally, it helps aid the digestive processes, combats infections, and fortifies the immune system. Always dilute essential oils before use, but be especially cautious with cinnamon as it can cause irritation if it is not diluted properly (about 10 drops of essential oil to every 1 ounce of carrier oil for a healthy adult). Cinnamon has an excellent reputation as an anti-diabetic herb due to it's ability to help lower blood sugar and improve sensitivity to insulin, which helps regulate blood sugar levels. It also helps curb the craving for sugary sweets and can be added to recipes to reduce the amount of sugar needed. Cinnamon is very beneficial for heart and circulatory health. It has been shown to reduce cholesterol levels, triglyceride levels, and blood pressure. It helps the blood to coagulate, which helps prevent and reduce bleeding. It increases circulation, and helps tissues to regenerate. This is especially beneficial to the heart as it needs to regenerate tissue to fight and/or recover from heart attack, heart disease, and stroke. Cinnamon contains quite a few antioxidants, many of which act to help to activate protein that protect brain cells from mutation and damage caused by aging. This has enormous potential to help prevent neurodegenerative disorders and diseases such as Parkinson's and Alzheimer's. Cinnamon is wonderful to use to help fight the bacteria that cause tooth decay, gum disease, oral infections, and bad breath. It's also smells and tastes great, so it makes a great addition to any natural tooth powders or mouthwashes. As a naturally antibacterial, antifungal, antiviral, and immune boosting herb, cinnamon works extremely well to help combat a number of infections. Not only does it help prevent infections, but it has been shown to be very effective at treating them as well. It's immune boosting properties are so potent, that it is even being studied as a possible treatment for HIV. Cinnamon has quite a few properties that make it wonderful to aid digestion and prevent digestive upset. It's carminative, which means that it helps to prevent and relieve gas and bloating. It soothes stomach and intestinal cramps and helps in the digestion of fats and sugars. Cinnamon helps reduce inflammation all over the body, which helps to reduce the risk of heart disease, cancer, brain function decline, and much more. These anti-inflammatory properties can help reduce pain, relieve muscle soreness, relieve pain associated with PMS, reduce the severity of allergic reactions, and may help relieve arthritis pain. If taken in small amounts, cinnamon is not known to cause allergies or negative reactions. However, when taking extracts or essential oils, it is possible to take cinnamon in a large enough quantity that it may negatively interact with certain medications and medical conditions. Please check with your doctor before supplementing with cinnamon. Use caution with cinnamon if you are pregnant and/or breastfeeding. When using cinnamon essential oil, make sure to properly dilute the oil and to use a patch test as cinnamon can be very irritating to the skin. I hope I have given another reason to fall in love with cinnamon this Holiday Season. Let me know how you feel about cinnamon, I love hearing from you!